If you live in Thailand, working as a dive instructor, people think that you are constantly on holiday. Not so, and it’s good to get away once in a while, go diving somewhere else for a bit of fun, to see something different and keep island fever at bay. Khao Sok National Park is as different as you can get from Koh Tao. The park is made up of thick ancient rain forest, calm and peaceful, with beautiful limestone columns towering out of the 165sq km lake that dominates the park. Most people go to trek in the jungle, spot wildlife and absorb the tranquillity, but a lake that large holds too much temptation for avid divers. This is where we go to chill out! The lake was created due to a damming project which has left many of the stunning rock formations underwater. 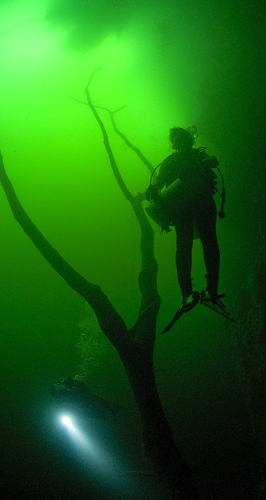 While the underwater the terrain remains largely uncharted, gradual, careful research and exploration has located many divers’ playgrounds with many new sites waiting to be discovered. There are villages at the bottom of the lake just waiting to be explored as well as cave systems waiting to be named. The team are on the hunt to locate an old mountain pass which due to the water level is now a long swim though! I can’t wait for that one! 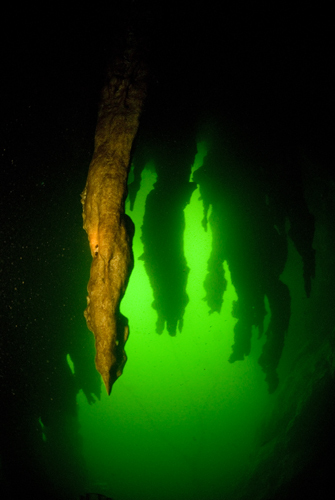 We do take divers here for trips and there really is something here for everyone. There’s plenty to see well within the lightzone with some stunning overhangs and rock formations to swim around. Swimming around some of the stalagmites and stalactites you will be both dwarfed and awed by the gradual march of nature that has created these behemoths. The fresh water had preserved the submerged trees and at certain points it can be like swimming around an enchanted forest. For the more adventurous it’s the perfect place to complete cavern or cave training and if you’re already certified then you’ll be like a kid in a candy store! Diving in the park takes you back to the old days of Koh Tao. A limited number of longtails provide the only transport on the lake and a backward roll entry is only way to splash in. The water is warm but once you descend through the first few meters the temperature drops a few degrees and it becomes crystal clear. The water has a greenish tinge rather than tropical blue and sets a great atmosphere for the fantastic structures below the surface. The overnight accommodation is simple but somehow once on the lake you don’t seem to need much! Raft houses made up of individual bungalows floating on the lake are pretty much the norm. The food is traditional and tasty and the friendliness of the families who run these resorts is refreshing. Sunset is stunning and waking up to the sound of actual monkeys in the morning is something to remember. We always find ourselves planning our next trip before we have even got home!